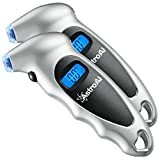 Sold by SmartireDirect and Fulfilled by Amazon. Gift-wrap available. 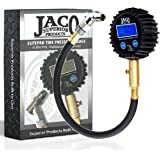 Save an extra 10% when you apply this coupon. 10% extra savings coupon applied at checkout. Sorry. You are not eligible for this coupon. 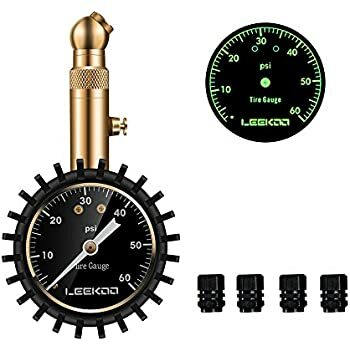 2.LEGIABLE 2” DIAL,GLOW IN THE DARK,Clear display, easy to read even in the very low light condition, range to 60psi, this tire manometer keep high performance for your bicycles, motorcycles,cars using,good tire gauge pressure. 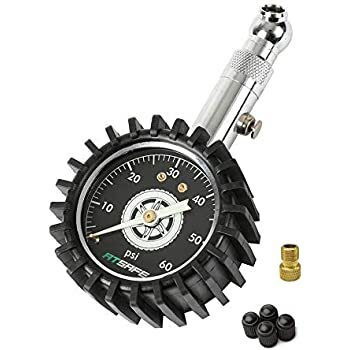 3.THICKER AND STRONGER 360 DEGREE SWIVELLING CHUCK,Easy to operate in different directions.heavy duty, no air leakage.chrome-plated chuck make the air pressure tire gauge with good appearance and corrosion resistance even after many years. 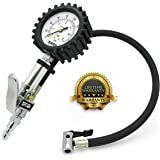 4.WHAT’S IN THE BOX, Not only 1 pcs tire pressure gauge,but also1 pcs presta valve adaptor and 4 pcs tire valve caps as bonus, great choice for Christmas Day gift. 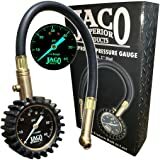 5.LIFETIME SATISFACTION GUARANTEE AND FRIENDLY CUSTOMER SUPPOR,Buy with confidence,save a fortune with improved gas mileage,and enjoy a smoother and safer driving experience, also a good choice as a father's day gift. 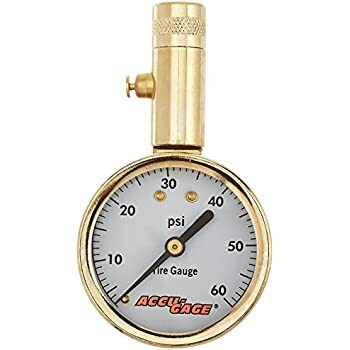 Why Choose ATsafe Mechanical Tire pressure gauge? Accuracy: ANSI B 40.1 Grade B. Get One For You And Your Family! I am OCD when buying gadgets. Price/Quality A+++. I already did the comparisons and I am extremely pleased with my selection. 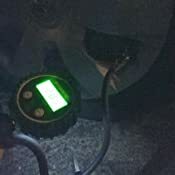 If you are worried about batteries, this one turns off automatically when not in use. Even the fittings are high quality. I was afraid the “trigger” might be “cheap” because of the stock photos. Nope! It’s nice and thick and not wobbly. I didn’t read the (included) instructions and still figured everything out including the LED nightlight. Great Investment and accurate. 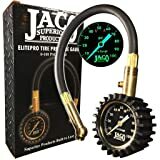 IT WILL PAY FOR ITSELF by maintaining correct tire pressure!!! Thanks for reading my unsolicited review. 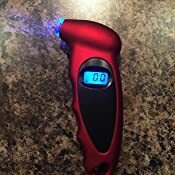 5.0 out of 5 starsHigh quality, very easy to read, great customer service. There is no straining of your eyes, It just feels of quality. 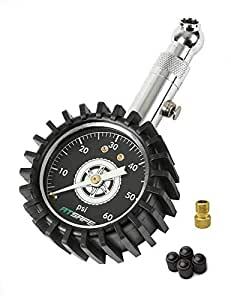 The supplied tire chuck works every time, If you want to air up your tires and have have your tire air pressure sensor in your car match up even on all four tires and to do it quick this is the way to go. 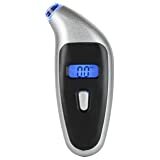 I love this inflator, I love the digital readout and the ability to add or remove air with this one device,the only thing I dont like is its battery operated... 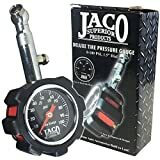 I figured they would have used air pressure to have the ability to use the readout for power... that's my only complaint it would be 4.5 stars but Amazon wont allow half a star. 5.0 out of 5 starsGood gift ! 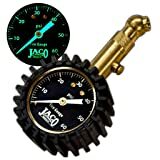 I bought this tool as a gift for my friend, he was very excited to use this gauge for his car, it's the solid feel and overall good quality. 3.0 out of 5 starscould be accurate but not precise. I don't know if my unit is defected or not. The reading only gives 0.5 increment. For example when the reading is 35psi, it could be actually mean 35.3 or 34.7. If you inflate or deflate the tire, the next read would be either 35.5 or 34.5. It takes a lot of guess work. May be okay with some people, but I found it annoying when my TMPS shows the tires have different psi. 5.0 out of 5 starsA must have!! Love having this. 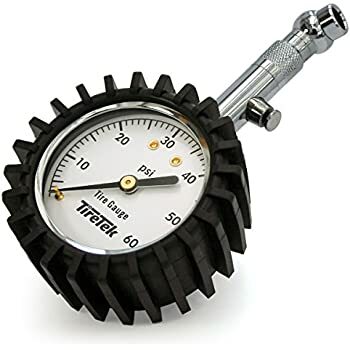 Makes it quick and easy to fill tires on vehicles and bicycle tires. Solid build that should last many years. 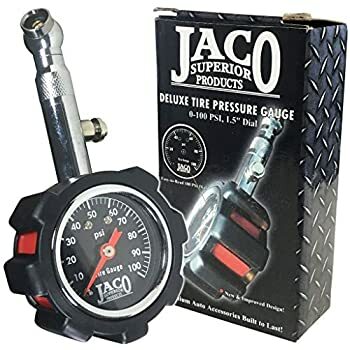 5.0 out of 5 starsGreat, hefty tire gauge. 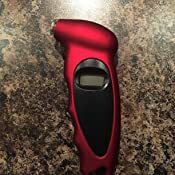 Husband very impressed with this tire gauge. So easy to hold onto with its rubber tire feel. Even included caps for tire stems in case of misplacing. 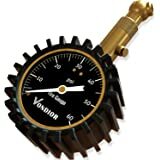 I could say it's just a tire gauge, but some thought went into this product! 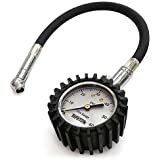 This is the best tire gauge I have had. I love how easy it is to use. 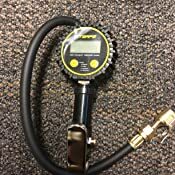 It is easy to read, it stays on the tire valve so there is no fussing with it and the reading is very accurate. It does everything I wanted it to do and more.